My colleague Noam Scheiber has parsed Federal Reserve Chairman Ben Bernanke’s testimony about the power of the Federal Reserve, but Bernanke also commented in hearings yesterday about government fiscal policy; and what he had to say was, to say the least, disturbing. Echoing the charges of economic conservatives and Wall Streeters like investment banker Peter Peterson, Bernanke took aim against what these folks call “entitlements,” but which are known popularly to be social security and Medicare. Republicans can be expected to cite his comments in the current debate over the Democratic health care reform bill. How a society cares for those too young, too old, or too sick to work is a test of its maturity, and level of civilization. Social security and Medicare are among the foremost achievements of American government in the twentieth century. If the government needs more money to fund social security, which it presently does not, there are a host of remedies besides cutting benefits. For instance, it can always raise the limit on how much income is subject to a social security tax. Medicare is the most penurious and least wasteful of health insurance programs. If anything, a dispassionate policy-maker concerned about healthcare costs might have insisted that the private sector insurance emulate, or perhaps be folded into, Medicare. But in discussing “entitlements,” Bernanke insisted that what would have to altered is how much these programs spend. He even threw open the question of whether these programs should be mandatory. When asked whether the deficits that he saw these programs as creating could be met by higher taxes, Bernanke refused to make any comments on taxes. “I have done my best to leave that authority where it belongs, with the Congress,” he said. Yes, sure, raising or cutting taxes is Congress’s job. But so is spending money on social programs, about which Bernanke, eager to plant his flag on the side of the anti-entitlement camp, was not loath to comment. When I read a few of Bernanke’s comments yesterday, I thought, well, maybe they were taken out of context. Why would someone seeking to be confirmed by a Democratic majority go out of his way to promote starkly Republican concerns? SEN. BENNETT: Yes. I'm an appropriator, which is maybe not a good thing to do and be in this election year, but I'm an appropriator. The Appropriations Committee has influence over one third of the federal budget. The other two thirds is on automatic pilot, and mandatory spending for entitlement programs, we're discussing on the floor of the Senate the creation of another major entitlement program and the percentage that we have any control over keeps going down…. 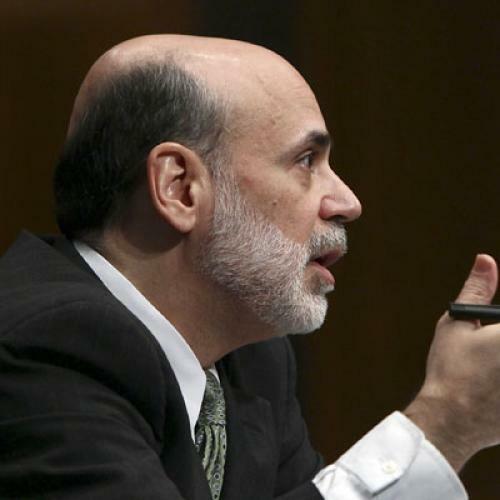 MR. BERNANKE: Well, Senator, I was about to address entitlements. I think you can't tackle this problem in the medium term without doing something about getting entitlements under control, reducing the cost, particularly of healthcare. It's only mandatory until Congress says it's not mandatory, and we have no option but to address those costs at some point or else we will have an unsustainable situation. SEN. REED: So you would concur that our effort today to pass health care reform is critical to our economic future? MR. BERNANKE: I'm not going to comment on the overall health care bill; what I will just say is that I think an essential element would be to try to reform health care in a way that controls costs going out. That's going to be essential. SEN. REED: And that's what the CBO has concluded in their evaluation of the Senate plan before us. Is that correct? MR. BERNANKE: They've talked about some premiums. I don't think they have made a strong statement about the share of GDP devoted to health care, for example. SEN. REED: Well, they've indicated that going forward there would be cost savings. And I think, from my view, the faster we get this accomplished, then we can move on to some of the other issues we've talked about today. But I recall the '90s, because I was here, that there's only two, really, ways you can deflect this deficit and that's either by cutting expenditures or raising income taxes or other forms of taxes. Can you think of another way? MR. BERNANKE: To reduce deficits? MR. BERNANKE: Well, just logically, there are other kinds of taxes besides income taxes. SEN. REED: No, no, I concede that -- some type of tax. SEN. REED: Would you take taxes off the table? SEN. REED: Well, your predecessor signaled very strongly that the tax cuts in 2000 were appropriate. MR. BERNANKE: I have not done that. I have done my best to leave that authority where it belongs, with the Congress.